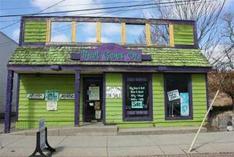 The building has a long history as one of Grand Rapid's premier record and ticket selling venues and had done business under the names Believe In Music and The Beat Goes On. 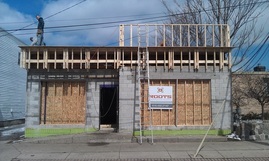 Roman purchased the building in December of 2012 and a great team of professionals was put together to begin the process of designing and remodeling. Although the building needed extensive work, the basic foundation was solid and the location was perfect for a restaurant/catering concept. Over the next few months the building was transformed into what it is today. Some of the cool art work inside the building is in memory of the mural that used to adorn the outside walls. told him he got him a job in his friend's restaurant. That turned out to be the start of an exciting and rewarding career working in hospitality industry. consecutive years during his time there. 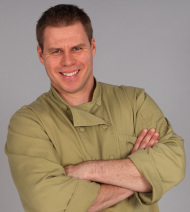 and busy professional couples, Roman was also fortunate enough to be the Private Chef for NFL player Isaac Bruce and NBA player Larry Hughes as well as members of the Anheuser-Busch family. 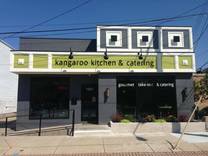 In 2012, after a move to Grand Rapids Michigan, Roman felt the time was right to set up his own location which eventually lead to the opportunity to purchase the property at 1007 Fulton Street East and open Kangaroo Kitchen & Catering.